Today, if Paul were still around, he wouldn’t have to borrow a D’Angelico. 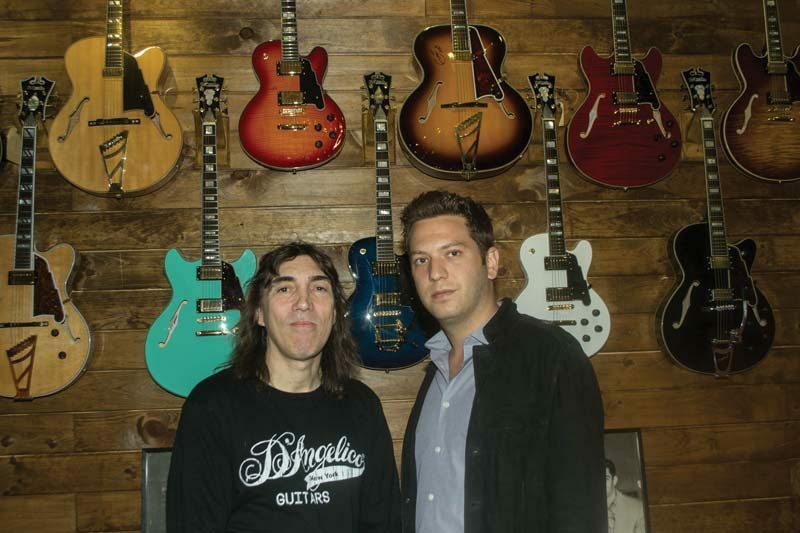 In 2013, after a dormancy of a half-century, the brand began building and distributing guitars again, under the tutelage of Pisani, CEO Brenden Cohen and their partner John Ferolito Jr., who runs D’Angelico’s parent company, the New York-based GTR Store. Today, the company’s newly produced, much-sought-after archtop hollowbody, solidbody and semi-hollowbody models are available via hundreds of American dealerships-both brick-and-mortar and online-as well as in 20 foreign countries. Mandolins and acoustics are scheduled to follow. “This is a very iconic guitar,” says Cohen, and although he does have a vested interest in stating this, the facts back him up. The original run of D’Angelicos consisted of 1,164 known pieces, the details behind the crafting of each one kept in a ledger by master luthier John D’Angelico, who founded the company. Many survive, in various conditions, and when they do turn up for sale, at auctions or privately, they have been known to bring in tens of thousands of dollars. “Sometimes they change hands among players; sometimes people trade three or four guitars to get one of these guitars,” says Pisani. By “always” he means the better part of the past 80-plus years, when D’Angelicos were in use regularly among players in jazz orchestras and small combos alike. D’Angelico, Master Guitar Builder: What’s in a Name?, a 2008 book published by Centerstream, includes numerous paeans by guitarists active as far back as the WWII era who still had fond words for their D’Angelicos and for the man who fashioned them. In 1952 D’Angelico hired an assistant, Jimmy D’Aquisto, who himself became a master luthier and took over the company upon D’Angelico’s premature death in 1964. 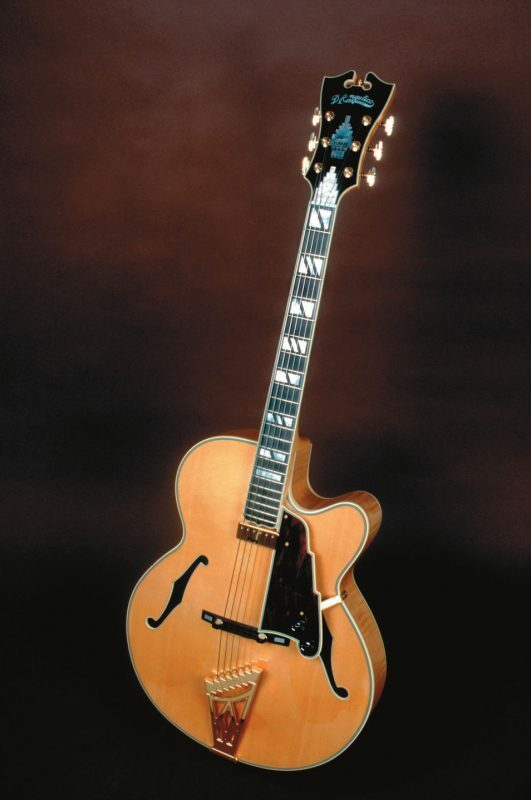 D’Aquisto continued to create guitars under his own name, and from the ’60s until now the D’Angelico guitar ceased production, with the brand passing hands among various owners until it was purchased in 2011 by John Ferolito Sr., owner of the Arizona Beverage Company and a guitar aficionado. With his son, John Jr., Cohen and Pisani at the helm, a business plan was launched and two years later the first reissues and newly designed D’Angelicos made their way into the hands of players. D’Angelico’s Korean-made Standard Series, which widens the brand’s oeuvre to include everything from ES-335-style semi-hollowbodies to an electric bass, starts at around $1,300. The company’s Pro Series, manufactured in Kalamazoo, Mich., starts at around $4,000 and its USA Master Builder line runs $10,000-$12,000. Those guitars, including faithful replicas of D’Angelico’s famous traditional vintage models, are handcrafted in Arroyo Grande, Calif., by builder Gene Baker and his team.